Today, we have Jessica from A Kitchen Addiction. We first met at Food Blog Forum last year. She is super sweet and bakes up some even sweeter recipes! I encourage you to go check out her blog and take a look at a few of my favorite recipes from her: Carrot Cake Scones, Fudge Frosted Peanut Butter Cake, and Strawberry Cream Stuffed Cinnamon Sugar Pretzels! Hi! I’m Jessica, and I blog over at A Kitchen Addiction. When Katie asked me if I would be willing to guest post for her, I jumped at the chance to be able to help out. I was able to meet Katie last year and she is just as sweet in person as she seems online! She definitely deserves a break from posting so she can snuggle her new, precious little boy! Since life is crazy busy for Katie right now (and I’m sure for a lot of you! ), I wanted to share an easy recipe that required the minimum amount of work but still tasted like you were in the kitchen for awhile! My mind instantly went to some sort of cream pie. I love making cream pies, because they are super versatile and most of the time the ingredients are already in our cupboards. 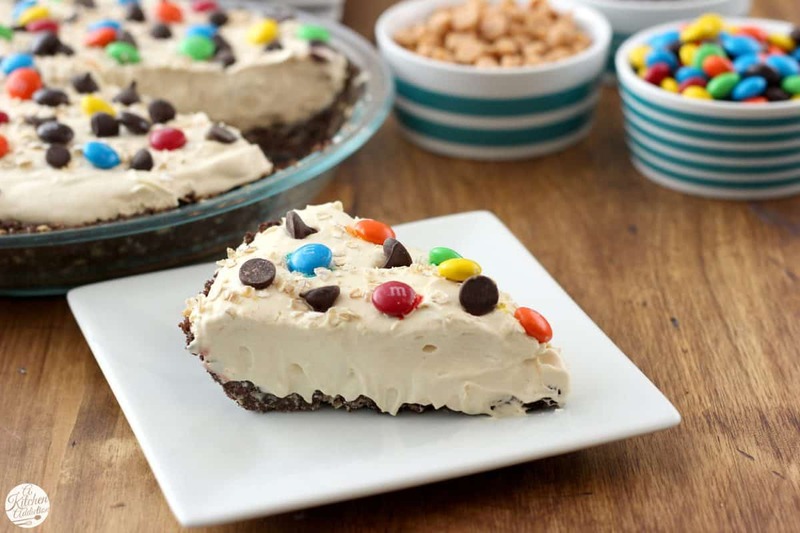 This peanut butter monster cookie cream pie is a combination of all things good about monster cookies, which come to think of it, is everything! 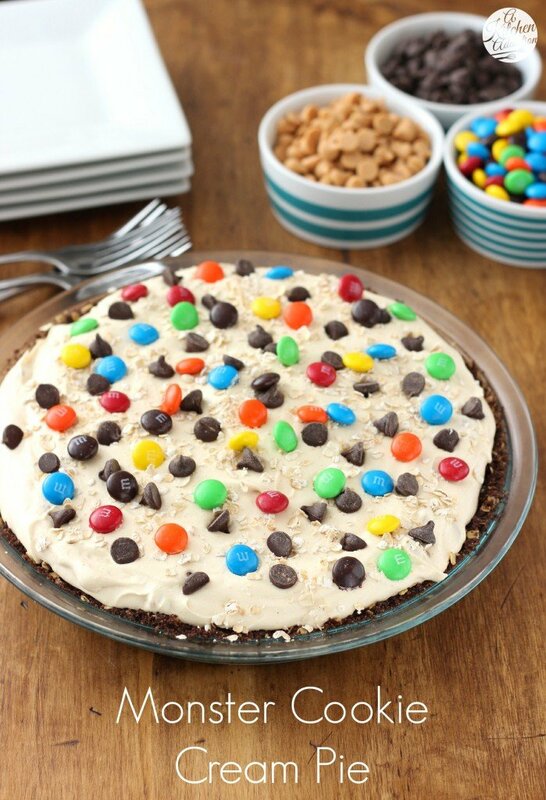 There’s peanut butter, oats, chocolate chips, peanut butter chips, and, of course, M&M’s! The base uses chocolate graham crackers, but feel free to swap them out for regular graham crackers. The same goes for the pudding. This recipe uses vanilla pudding, but I’ve made it with chocolate and it’s just as tasty! If you really wanted to go the quick and easy route, you could use a pre-made crust. But, I really think the 8 minutes it takes to bake it is worth it! The oats and graham cracker crumbs are combined with brown sugar and a bit of vanilla extract to give the crust the flavor of an oatmeal cookie. Just the base you need when making a monster cookie pie. So go check out your cupboards and the fridge, I bet you have most of the ingredients to make this pie today! Stir together graham cracker crumbs, oats, brown sugar, and salt. Stir in melted butter and vanilla. Press into the bottom of prepared plate. Bake for 8 minutes. Remove from oven and allow to cool completely. Whisk together pudding mix and brown sugar. Whisk in milk until smooth and thick. Add in the peanut butter and vigorously whisk to combine. Gently fold in whipped topping. Stir in peanut butter chips. Pour into cooled pie crust. Sprinkle oats and chocolate chips on top. Refrigerate 1-2 hours until firm. 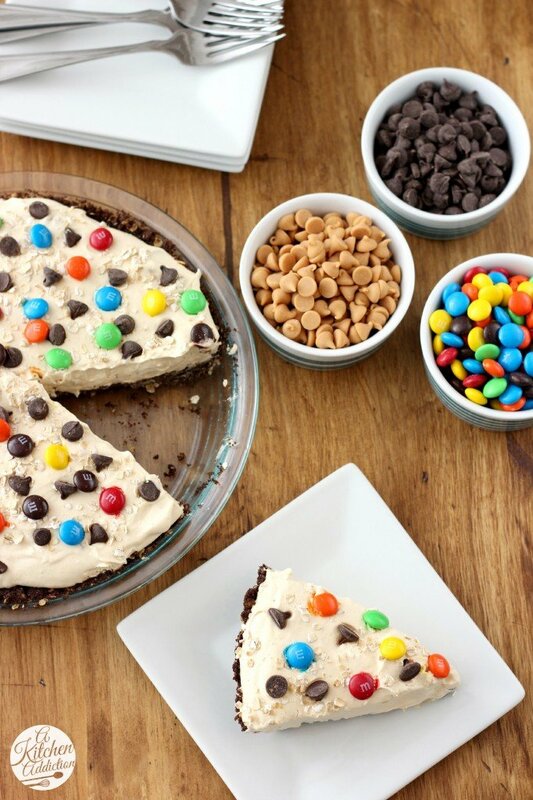 Sprinkle with M&M’s right before serving. You had me at “cookie” and “pie” in the same recipe title. OH MY YUM. I cannot get over the awesomeness that I’m staring at right now. Like…WHAAA?! I’m obsessed. So much yum in one pie. And so simple to make! That=dangerouuuus!